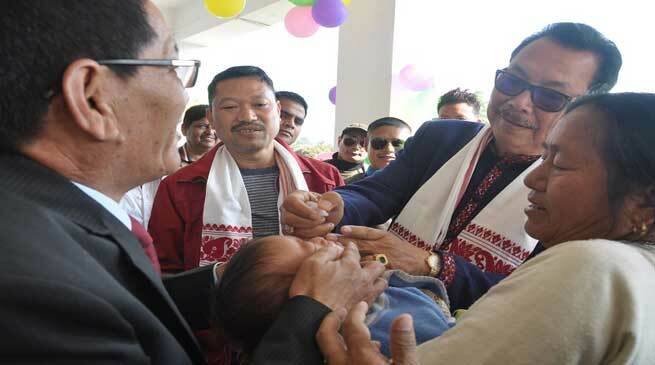 Deputy Chief Minister Chowna Mein and Parliamentary Secretary Planning also legislator Namsai Chow Zingnu Namchoom launched Intensified Pulse Polio Immunization (IPPI) campaign on Sunday at Government ANM School Namsai by administering pulse polio drops to the new-born and other infants. They were accompanied by Deputy Commissioner R.K.Sharma, DMO Dr Nani Rika, ZPC Chow Kyasing Mounglang, DRDA (PD) Vijay Talukdar, ZPM Mahajini Chowpoo, MO (in charge) Chow Lot Manchey, other officers from CHC and various departments, ANM trainees and ASHA workers. The IPPI (NID) booths have been set up for administration of Pulse Polio drops to children aged-group to 0-5 years in the arranged booths throughout the District to be followed by house to house search and coverage activity. Children who are regularly immunized will also be vaccinated. He along with MLA inspected the district hospital and paid visit to Dental surgeon room, maternity ward, neonatal intensive care unit, operation theatre and also visited few patients and enquired about their well-being. Later, Mein also inspected the newly established Government Nursing School. DMO Dr. Nani Rika highlighted about the Heath scenarios of district, issues and problems faced by the district authority. The principal incharge of the nursing school Nang Sanjana Namchoom briefed about the status of the nursing school, and DRCHO Dr Pill Dipen highlighted the polio scenarios in global and India through PPT presentation. While assuring to support all necessary equipment and instrument for hospital as well as Nursing School, Dy CM asked the health authority to submit a comprehensive proposal mentioning all requirements such as medicines, manpower, equipment and machineries including all renovation works and new constructions if need be. The Dy CM asked the authority to prepare proposal purely on need base, and said that the government would fund for a complete proposal rather than for piecemeal requirements. Earlier, Mein and Namchoom flagged-off highly equipped ambulance for Namsai District hospital and School Bus for Government ANM School.